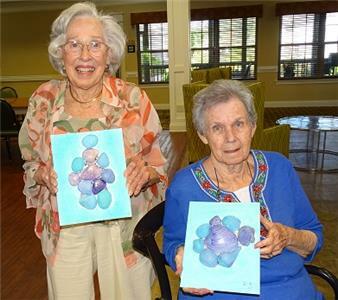 The residents of Morning Pointe of Chattanooga – Shallowford brought the fun of the ocean to the Tennessee Valley with some beautiful seashell canvas art. When a volunteer returned from the beach with a bag full of seashells, the residents of the assisted living community knew they had to turn these shells into works of art. Holly Holcomb, the Life Enrichment director at Morning Pointe of Chattanooga – Shallowford explains how the residents created their canvases, “After painting the shells in several shades of blue and purple, they [the residents] painted their canvas with watercolor to make a sheer, pale color for the background. "The majority of our communities include spaces dedicated to creating art. Residents can initiate a project on their own, join in on instructive sessions or watch local artists at work. Art is a recognized form of therapy, no matter a person’s level or ability, and often these projects are on display in the community," officials said.